How to fix broken videos (avi) in Ubuntu or Fedora linux? A video is worth billions of words but when a video doesn't play properly i.e. when it plays in discontinuous motion, the video loses all the juice it has. In this article we will tell you how to fix your favorite videos (which are in avi format) in both Ubuntu and Fedora Linux using an utility called the DivFiX++. These methods can also be applied to other Linux distributions. DivFix++ is a smart repair utility for AVI Video files. This utility is very useful when it comes to avi video files for which there exists no index part. Generally when you try to play such a file, the player will throw an error saying it has no index or a similar error. It can also repair some corrupt avi files too. You can also preview your avi video files while you download them from ed2k and BT networks. DivFix++ Packages are available for Ubuntu, Fedora and OpenSUSE. You can download suitable packages from the list of files at http://sourceforge.net/projects/divfixpp/files/. 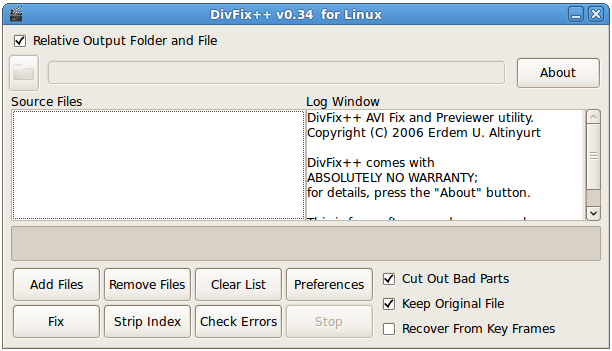 DivFix++ is also included on the software repository of Fedora Linux. The installation requires two dependencies to be installed: libwxgtk & libwxbase.